I recently posted an update to the Eval2 spreadsheet with a subroutine to display a cell formula as a text string, with the cell references replaced by the associated values. Addr2Val1 takes a text string as input and returns the formula with all cell references or range names converted to the value in the referenced cell. Cell references may be anywhere on any spreadsheet. The Eval function has been modified to work with cell references and range names, as well as optional lists of parameter symbols, and their associated values. Addr2Val2 works the same as Addr2Val1, except the input is an active cell formula, rather than a text string. Examples of each function are shown in the screenshot below, followed by source code for the Addr2Val2 function. Full open-source code for the other functions is included in the download file. Updated 3 Sep 2017: There seem to be issues with the WordPress system removing line breaks in some places, and inserting them in others. I have corrected the code below, but if you want to copy the code I recommend doing so from the download spreadsheet, rather than from the listing below, which probably still has some errors.
' 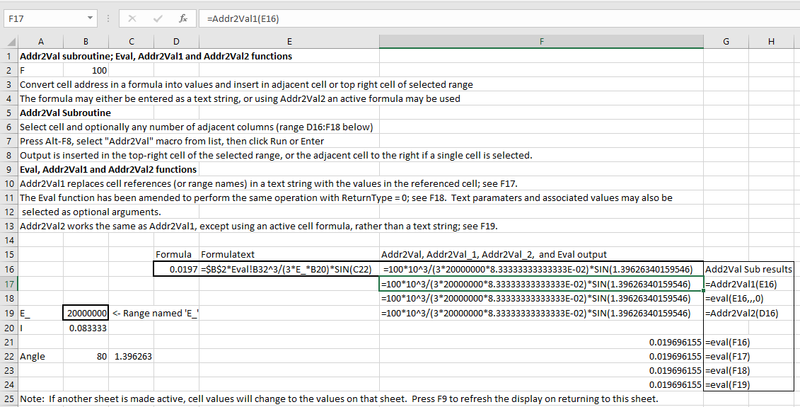 Evaluate a cell formula (Func), replacing cell addresses or range names with the values in the referenced cells.
' CommaDec = False (default) for no convertion. This entry was posted in Excel, UDFs, VBA and tagged display formula reference values, Evaluate text, Excel, UDF, VBA. Bookmark the permalink.